Flip Flap is a new multimedia installation by the Seoul and Berlin based artist Youngho Lee that combines video, 16 mm film strips and sculptural objects. 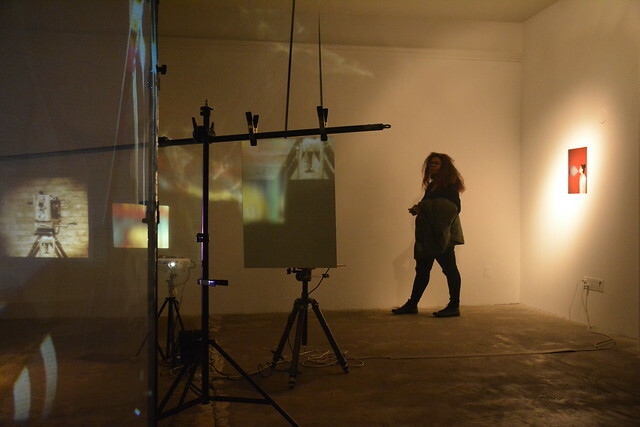 The artist describes her process as "digging through sites of visual devices, film and social history, and recombining them using sampling and remixing methods where media, film and installation are intertwined". Source material is both deeply personal and popular. Youngho Lee brings back to life specific memories using props and models that are shown alongside material such as archival television clips and You Tube videos. The viewer is invited to enter a personal fantasy theater space that arouses excitement and where time is simultaneously experienced as familiar and unfamiliar. This synesthetic environment offers a platform where the artist can develop new relationships between the digital medium and human senses. Youngho Lee most recenly participated in the Fellowship Program at Apex Art, New York. Recent projects and exhibitions include: the Seoul Art Space Geumcheon Residency, South Korea (2016-2017), Asia Culture Center/ACT Creator Residency, South Korea (2015-2016), Kuenstlerdorf Schoeppingen, NRW, Germany (2011), and took part in various exhibitions including Kunstforum Floesheim, Anita Becker Galerie, Staedelmuseum, Arko Art center, Daegue Museum, and Asia Culture Center. This program is made possible with support from Church & State by Lorenzo & Eunji Kim and apexart in NY.